lt;stronggt;ACI2103lt;/stronggt;lt;BR/gt;Paperpro 12-Sheet Capacity Compact Three-Hole Punchlt;BR/gt;Advanced dies make punching 40% easier. Compact size with space-saving lock down handle and internal waste chamber with easy-access rear door. Convenient ruler with paper guide. 12-sheet capacityjam-free mechanism. Non-slip rubberized base. Sheet Capacity: 12 Operating Method: Manual Number of Holes: 3.lt;BR/gt;lt;BR/gt;lt;stronggt;MMM6200341296lt;/stronggt;lt;BR/gt;Paperpro 12-Sheet Capacity Compact Three-Hole Punchlt;BR/gt;Economical, permanent adhesive tape is ideal for mending and splicing. Matte finish makes it virtually invisible on most surfaces. Polypropylene backing accepts most ink and pencil marks. 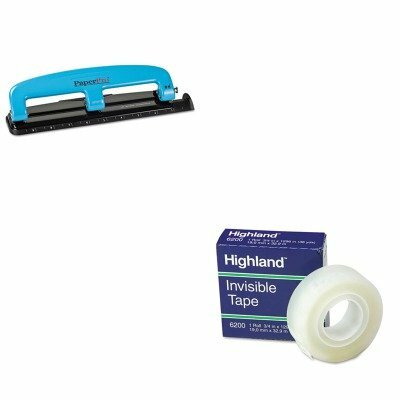 Tape Type: Invisible Adhesive Material: Acrylic Width: 3/4amp;quot;.